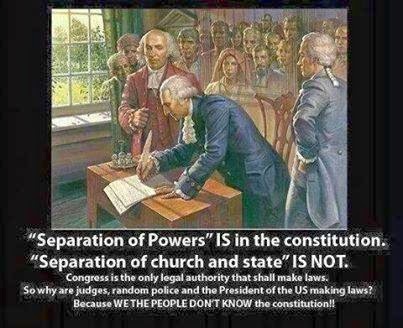 It is important for freedom loving Constitutionalists to educate other Americans on the origins of Separation of Powers and the non-existent Separation of Church and State. 1. Separation of church and state is a bedrock principle of our Constitution, much like the principles of separation of powers and checks and balances. In the first place, the Supreme Court has thoughtfully, authoritatively, and repeatedly decided as much; it is long since established law. In the second place, the Court is right. In the Constitution, the founders did not simply say in so many words that there should be separation of powers and checks and balances; rather, they actually separated the powers of government among three branches and established checks and balances. Similarly, they did not merely say there should be separation of church and state; rather, they actually separated them by (1) establishing a secular government on the power of "We the people" (not a deity), (2) according that government limited, enumerated powers, (3) saying nothing to connect that government to god(s) or religion, (4) saying nothing to give that government power over matters of god(s) or religion, and (5), indeed, saying nothing substantive about god(s) or religion at all except in a provision precluding any religious test for public office. Given the norms of the day (by which governments generally were grounded in some appeal to god(s)), the founders' avoidance of any expression in the Constitution suggesting that the government is somehow based on any religious belief was quite a remarkable and plainly intentional choice. They later buttressed this separation of government and religion with the First Amendment, which affirmatively constrains the government from undertaking to establish religion or prohibit individuals from freely exercising their religions. The basic principle, thus, rests on much more than just the First Amendment. That the words "separation of church and state" do not appear in the text of the Constitution assumes much importance, it seems, to some who once mistakenly supposed they were there and, upon learning of their error, fancy they’ve solved a Constitutional mystery. To those familiar with the Constitution, the absence of the metaphorical phrase commonly used to name one of its principles is no more consequential than the absence of other phrases (e.g., Bill of Rights, separation of powers, checks and balances, fair trial, religious liberty) used to describe other undoubted Constitutional principles. Doug Indeap Your dissertation is premised that "Separation of Church and State" is a bedrock principle of the Constitution like the Separation of Powers. If it were a bedrock principle, then where is "Separation of Church and State" in the Constitution or the Bill of Rights. Your philological analysis reads as folderal. While the "Separation of Powers" may not be used per se within the Constitution, a scholarly analysis can point to how Articles One, Two and Three impose checks and balances on the branches of government. At least your invocation of Madison's Detached Memoranda from 33 years after the drafting of the Constitution is not the common lot of using Jefferson's 1802 letter to the Danbury Baptist Church. I wholeheartedly agree that the Founding Fathers as well as the drafters of the Constitution did not desire a State religion imposed by the Federal government, it is not in the bedrock principles. In fact, the First Amendment did not abrogate remaining State religions. 2. While the First Amendment undoubtedly was intended to preclude the government from establishing a national denomination or state controlled church as the video notes, that was hardly the limit of its intended scope. The first Congress debated and rejected just such a narrow provision (“no religion shall be established by law, nor shall the equal rights of conscience be infringed”) and ultimately chose the more broadly phrased prohibition now found in the Amendment. During his presidency, Madison vetoed two bills, neither of which would form a national religion or compel observance of any religion, on the ground that they were contrary to the establishment clause. While some in Congress expressed surprise that the Constitution prohibited Congress from incorporating a church in the town of Alexandria in the District of Columbia or granting land to a church in the Mississippi Territory, Congress upheld both vetoes. Separation of church and state is hardly a new invention of modern courts. In keeping with the Amendment’s terms and legislative history and other evidence, the courts have wisely interpreted it to restrict the government from taking steps that could establish religion de facto as well as de jure. Were the Amendment interpreted merely to preclude government from enacting a statute formally establishing a state church, the intent of the Amendment could easily be circumvented by government doing all sorts of things to promote this or that religion–stopping just short of cutting a ribbon to open its new church. The video relies on Barton!? Zealotry more than fact shapes his "work," which has been so thoroughly, repeatedly, and authoritatively debunked by so many who have demonstrated it to be riddled with slipshod research, shoddy analysis, and downright dishonestly that I can but wonder how anyone can call him an authority on this subject without turning red from embarrassment. Perhaps the handiest debunking is Chris Rodda's book, Liars for Jesus: The Religious Right's Alternate Version of American History (2006) (available free on line http://www.liarsforjesus.com/), where she conveniently collects and directly refutes his many mistakes and lies, all with documentation and references so complete one can readily assess the facts for one's self without the need to take either Barton's or Rodda's word for it. Doug Indeap While I appreciate your extensive answers, the ad hominem attack on BARTON! Citing Chris Rodda is instructive. The Military Religious Freedom Foundation's goals sound noble but it would seem that it takes Religious Freedom to be Freedom of Worship, meaning that the values and beliefs from following one's faith are to be relegated to behind church doors. Kind of like the current trend of the federal government. Thank you for your extended and generally thoughtful challenge. It is edifying to elevate debate and exchange ideas.